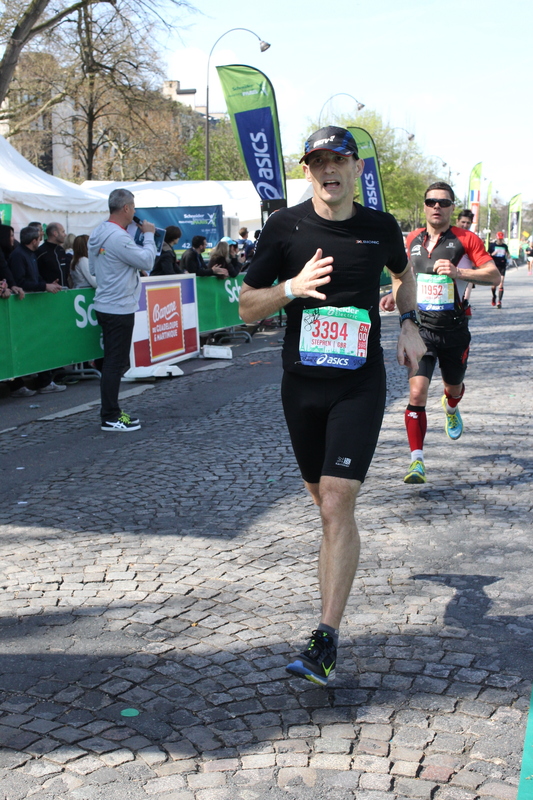 The Paris Marathon 2015 was to be my fourth Paris Marathon and I was determined it would be my fastest. I began in 2012 with a 3:43 finish. In 2013 I achieved my goal of sub 3:30 coming in at 3:28. Things went very wrong in 2014 when a lack of dedicated training and a slight injury over the winter months meant I finished in 3:37. This year I was back to my best, better than my best in fact, and ready to blow my previous PB away. During Christmas week 2014 I took part in the Phoenix Year End Marathon, run on a course by the River Thames. It became my PB course when I finished in a rather unexpected 3:18. I had upped my training since then and I was even hoping I might dip under 3:10 if I ran really well. However, that would require everything to work out perfectly and in my experience that only happens around once in a season, if that. The trip didn’t get off to the best of starts. In previous years we have driven to Dover, caught the ferry to Calais and driven to Paris. However, we have gone all green an purchased a fully electric car. Consequently, long distance journeys in the UK are no longer possible without meticulous planning and nigh on impossible abroad. So we decided to take the Eurostar. Perhaps somewhat naively I thought this might be quite relaxing not having to drive all that distance. I didn’t count on two little children getting ratty, fighting and generally being particularly challenging for the entire day. Being stressed prior to your A race is not something to be encouraged, but sometimes it is unavoidable. 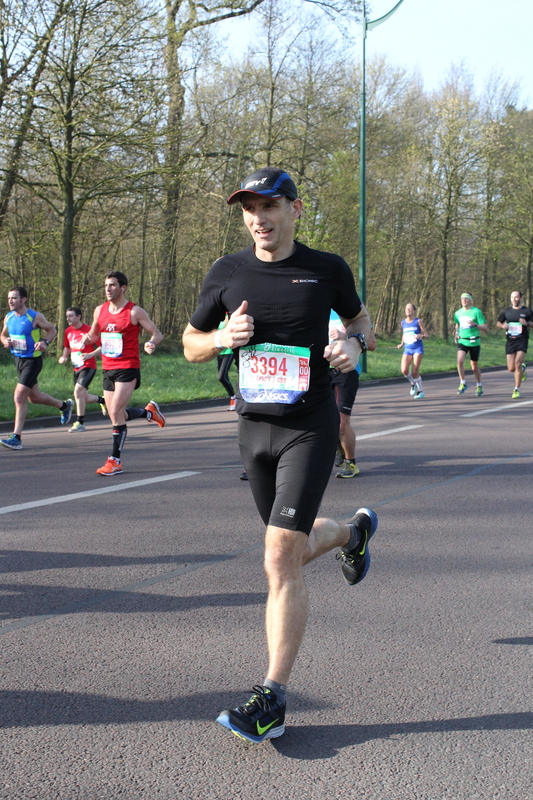 I made the decision quite early in the year that the Paris Marathon 2015 would be my main race of the spring and that I would not take my GoPro with me whilst running. 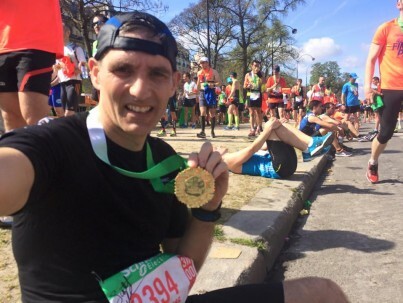 All my training and my taper period were all built around Paris, even though I would be running my first ever London Marathon just two weeks later. I had decided I would attempt a PB in Paris and if it didn’t work out I would try again in London. I got to the Expo very early on the Saturday morning, knowing that it would get very busy. Because I was on my own, I was able to spend a good while at the Expo. I had one major thing I wanted to do, which was to meet Scott Jurek. If you have not heard of him, you should check him out. He is an ultra runner who won the Western States 100 as a complete unknown and went on to win it something like 7 times in a row. He is the subject of a very famous book called Born to Run, of which you might well have heard. He is also a plant based runner and has now written a book himself called Eat and Run. I made sure I was at the front of the queue at the Brooks stand to meet him. Unfortunately, all the copies of his Eat and Run book were in French, so I apologised to him for not buying it. He signed my race number instead, which I will not be throwing away! Then I took a chance and asked if he would be willing to say something on camera about this website. He was more than happy to do so and I was childlike in my excitement at the coup. I mean, this guy is essentially the king of ultra running, and I got him on camera promoting my website! Awesome. Expo done and less than 24 hours later I was on the RER with my wife and brother-in-law from La Defense to the Champs Elysee for the Paris Marathon 2015. Little tip, if you can, catch the RER rather than the Metro. Fewer stops and less crowded. Breakfast had been toast and jam and strong coffee, which normally makes me go to the toilet before leaving, but on this occasion we had to stand in a queue at the top of the Champs Elysee for a while, so I could use one of the portaloos. This made me a little late and I had to run down the avenue, which by now was crowded with people, to get to my starting pen right at the front behind the elite athletes. I had once again plumped for a 3hr pen so as not to get held up by slower runners. Unfortunately this did mean I had a lot further to go to get there! However, I made it just before they closed the gate. I absolutely love the atmosphere at the start of the Paris Marathon. It feels big. You can look behind you and because the start is on a slope, you can see thousands of people on the Champs Elysee all the way back up to the Arc de Triomphe. It is really cool and the organisers do a good job of pumping you up before the start. Very different to the start I experienced in London a couple of weeks later when it was cold and, at my start area, it was difficult to gauge the numbers. Paris wins over London for start atmosphere in 2015. I often think about the runners who will take 5 or 6 hours to complete a marathon. Firstly it must take forever to actually get to the start line. I mean literally 45 minutes after the gun goes off in Paris, some people are still waiting to start. Then, when you finally reach the last 6 miles, it’s so late that the crowd, who started so enthusiastically 5 hours ago when the Kenyans came through, is starting to wain somewhat and people are drifting off home. I’m imagining litter and scrub blowing across deserted city streets and a lone road sweeper looking up as you pass. Thankfully, I am able to get round a marathon course while the crowds are still in full voice. Paris is not in the same league as London for crowd numbers or crowd craziness. Although, I don’t think any of the other majors can compete with London for support. Nevertheless, Paris is well supported and the route is so lovely that the lack of crowd support at some points on the course is neither here nor there really. The run down the Champs Elysee and round Place de la Concorde at the start of the race is fantastic and really does set you up for the rest of the run. I started with my ideal 3:10 goal in mind and set off at 4 minutes 30 seconds per kilometre. I know I can keep this pace for at least 20 miles. I told Victoria and Sean not to rush to see me at 5km at Bastille and just to make sure they were there at 23km. This meant they could take their time getting to Bastille, which is one of the few viewing places where it’s possible to see runners at two points on the course. In previous years my support team have seen me off at the start then had to make a mad dash for the metro to see me pass Bastille at 5km and then had to wait another hour or so to see me come past again at 23km. I kept my pace very well for 20 miles. As the morning progressed it got warmer and warmer and this may have affected me a little. I did start to slow somewhat for the final 10km, but it certainly wasn’t a complete collapse as has happened before. I kept my composure and fought my way to the end. Unfortunately, the 3:10 goal had gone by 22 miles. My secondary goal was 3:15, which would mean qualification for next years London Marathon and the Boston Marathon. I could see I was still on for this right up to the final mile. I was very tired by this point and it was a struggle to keep a decent pace. 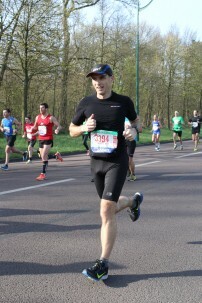 My last goal for the Paris Marathon 2015 was to at least get a PB. With a sprint to the line I finished in 3:16:07 just one minute away from that Good For Age London qualification, but over 2 minutes better than my previous best. I had real mixed emotions. If only I could have pushed just that little bit harder in the final 10k. But a fantastic PB nonetheless. I’ve got to be pleased with that…and I was. Last year I ran Paris in 3:37. I’ve done it 21 minutes faster this year after putting a lot of effort in in training since December. I decided that I would try again for my 3:15 goal in London. Once finished I made my way slowly through the crowds on Avenue Foch to meet my Brother-in-Law Sean and my wife Victoria at the Arc de Triomphe. I had made it clear prior to the race that this year I wanted to go for a proper latte post race. Where did they take me? McDonalds, where I got a rather small and pathetic looking black coffee. I mean really. It simply is not good enough! There’s a Starbucks just a hundred metres further down the Champs Elysee but no, just because my wife is on crutches, I get McDonalds. Rubbish. Note to my support staff…in 2016 I will be going to Starbucks by myself if I have to! If you have enjoyed reading my Paris Marathon 2015 race report, please share it with your friends and give it a ‘like’ or a Google +1. Thanks.